Before spring and summer arrive, it makes sense to prepare your March home to-do list. The more well prepared you are, the easier it becomes for you to relax and spend quality time for the remainder of the spring and well into summer months. In case any of these tasks are not completed because of weather or other conditions, you can simply postpone them for the month of April. The nice thing about creating your March home to-do list is you should schedule them for the weekends when you can indulge in deep cleaning your home from floor to ceiling. When cleaning, be sure to follow the manufacturer’s instructions. March heralds in the beginning of the warm season and the weather is only going to get warmer. When spring comes, you will need to move your clock forward by an hour as the days are going to get longer. This is the time for you to prepare for some spring cleaning tasks that will make your time in the coming days that much more enjoyable. 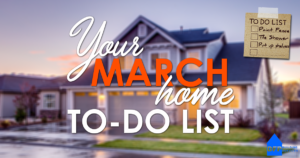 Here is a look at your March home to-do list. This is one part of the home that you should make sure you check if you have any loose or broken slates or tiles. It makes perfect sense to check whether the attic has developed any leaks. You can tell this by looking for signs of moisture in the home. Be sure to double-check the gutters and the French drain system as well as downspouts. They should not be clogged and the water should be allowed to move away from the foundation of your home. If a gutter is broken or loose, make sure you fix it as rainwater that pools will damage various parts of your home including the roof and ceiling as well as attics and walls. If you notice drainage problems, you need to clear all drains of leaves and debris that would have gathered in the winter months. Call in a contractor and/or landscaper to fix standing water on your property. Poor drainage can lead to flooded basements or other problems which is not what you want happening. If you notice cracks in the walls, then you need to get these repaired as soon as possible, so as to stop them becoming a major issue. Clean windows will allow you to get a good view of spring blooms. So, be sure to wipe the sills and clean the glass inside and out after which make sure you rinse with a hose. One of the best ways to make your home look more attractive in warm weather is by adding the right decorative pieces. This will not only make your home look better but it will also give you a chance to express your creative side. Depending on the last frost date, make sure you plan to plant summer plants and annuals as well as perennials. Be sure to make a plan (irrespective of prevailing weather conditions) to fertilise and prune select plants. Your home can do with some revitalising, so be sure to add fresh colours by giving a new coat of paint on the walls and try to introduce fresh plants. New wall art will also help you revitalise your home. Clean all your appliances from top to toe. Most ovens have a self-cleaning feature you can use to get rid of food drips and spillages. Get rid of your old thick tog rating and put in a light new duvet in its place. Also, be sure to spin your mattress over. During the winter, your fixtures lights and windows would have gathered dust. For the month of March, be sure to give these a good spring clean and also do the same for your windows and carpets. Be sure to spend a little time testing carbon monoxide and smoke alarms. Change the batteries if needed. Finally, set aside a little time to clean out unwanted things from your home. If there are old clothes and clutter, make sure you set aside time to remove these.